Every spring, Pitt-Greensburg’s Creative and Professional Writing majors submit their best work in poetry, fiction, and nonfiction for a chance to be awarded the Gerald Stern Poetry Prize, the Scott Turow Fiction Prize, or the Ida B. Wells Nonfiction Prize, in addition to a $100 scholarship and recognition at Pitt-Greensburg’s yearly Honors Convocation. 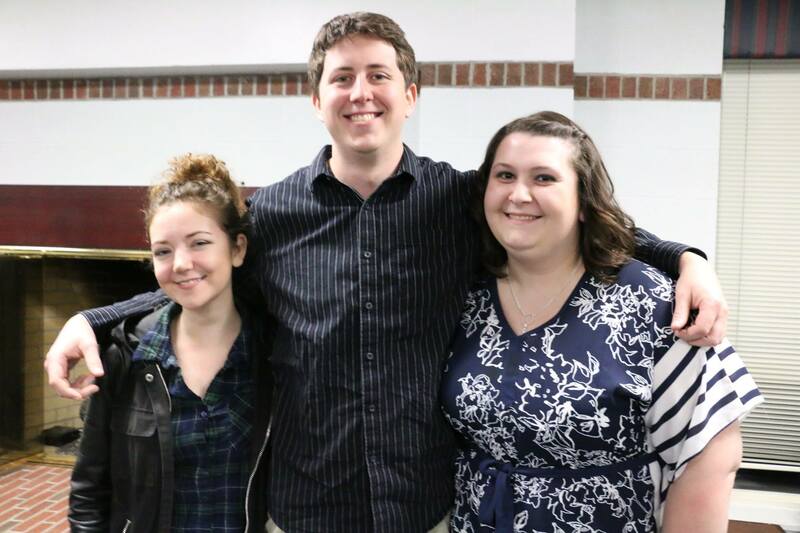 Writing Award Winners: Shannon Sankey, poetry; Kyle Holland, fiction; and Michelle Boring, nonfiction. This year’s winners, Michelle Boring, non-fiction; Kyle Holland, fiction; and Shannon Sankey, poetry, will receive a much more coveted prize: a full scholarship, valued at $1,000, to the Chautauqua Writer’s Festival, held Thursday, June 18, through Sunday, June 22, at the Chautauqua Institute in New York. Winners will get the chance to work with nonfiction writers Steve Almond and Lia Purpura, poets Tony Hoagland and Tim Seibles, fiction writers Jane McCafferty and Aimee Parkison, and songwriter Scott Minar. “Chautauqua, as a historical institution, is based around the idea of life-long learning, so there are writers of all ages and from all kinds of backgrounds that attend every year,” said Lori Jakiela, a co-director of the festival and a Pitt-Greensburg associate professor of English. Jakiela said that the scholarship and experience that comes with it will offer students once-in-a-lifetime experiences working with nationally- and internationally-acclaimed writers, as well as an environment that would help cultivate the ideas of student writers. The scholarship will also give students a chance to explore their writing potential outside the walls of Pitt-Greensburg. Because Jakiela is a co-director of the Chautauqua Writer’s Festival, Pitt-Greensburg was offered an opportunity to co-sponsor the event. The school must pay $1,800 to be a co-sponsor. The funds come out of the academic affairs budget and a second budget built from salary contributions from some of the writing program faculty members. Pitt-Greensburg receives advertising for the Professional and Creative Writing Program in return for co-sponsoring the festival. In addition to Pitt-Greensburg, Clarion University, Penn State Erie, The University of North Carolina at Wilmington, and Monmouth University are also sponsoring the festival and offering the same scholarship to students. The scholarship covers tuition, housing, and meals for the duration of the writer’s festival, four days and three nights. Workshops, readings, open-mic sessions, individual conferences, and panel discussions on publishing and revising are included in the tuition. Winners are responsible for travel expenses to and from Chautauqua. The directors of the festival are Philip Terman, an English professor at Clarion University; Sherrie Flick, a lecturer at Chatham University; and Lori Jakiela. Pitt-Greensburg students who don’t win a scholarship but would still like to attend Chautauqua’s Writer’s Festival are eligible for a discounted admission rate of $600, which covers tuition, housing, and food.